Please update to: "Don Pedro Lake, California, in the foothills of the Sierra Nevada mountain range, bordering the northwest corner of Yosemite National Park and lies at the base of the Stanislaus National Forest. Rolling green hills and oak trees surround the lake, which contains 13,000 surface acres of water. Lake temperatures vary, reaching over 80 degrees in the summer and dropping to about 45 degrees in the winter months. 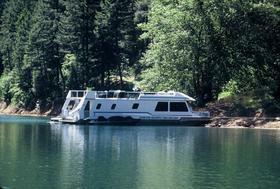 People enjoy many water sports on Lake Don Pedro including water skiing, sailing, canoeing, rafting, and fishing. Other predominant fish include Chinook Salmon, Land-locked Kokanee, Catfish, Crappie, Trout, Sunfish, Bluegill, and Carp. Many visitors come to picnic or camp near the lake while observing the diverse wildlife in this region. Commonly spotted animals include mule deer, raccoons, foxes, coyotes, Bald Eagles, and ravens. Situated in a canyon along the Tuolumne River the water level remains consistently high throughout the year due to the several tributaries draining into the lake. Cities near Lake Don Pedro include LaGrange, Sonora, Snelling, and Oakdale, California. It is 113 miles from Sacramento and about a 2-hour drive to San Francisco. The smaller towns around the lake provide recreation such as horseback riding, carriage rides, gold panning, museums, and shops. Mountain ski resorts and many outdoor activities at Yosemite National Park are both about an hour away from the lake.